Are you regularly working overtime? If so, are you being paid for it? The chances are that many of you reading this article are working hard and not getting paid for your overtime, while, at the same time there will unfortunately be a large number of readers who are unemployed. How did we end up living in a society where so many of us are either unemployed or working more hours than we are paid for? Imagine you are working in the light bulb industry. There are a couple of light bulb factories that, when combined, make just as many light bulbs as the world needs. You, and all your fellow factory workers, work eight hours per day. One day, someone makes an invention that allows the same number of factory workers to produce twice as many light bulbs as before. Since enough light bulbs are already being produced to meet the world’s demands, any sensible person would come to the obvious conclusion that you and your colleagues now only need to work four hours per day? Well, if this scenario occurred in our actual world, you would probably continue to work eight hours a day. This just seems to be the way we do things, whether it makes sense or not. The result is that too many light bulbs would be produced, half of the factories would go bankrupt, the majority of workers in the remaining factories would lose their jobs and the “lucky employees” would end up working more than eight hours per day, most likely without being paid for their overtime. Every day millions of people work for free in the form of unpaid overtime. Employers worldwide are feeling the pressure to achieve maximum productivity from their existing workforce and employees are willing to do what it takes to keep the jobs they have, as for many the only alternative is unemployment. I’m sure I don’t have to explain the negative effects that overtime can have on employees, both mentally and physically. Of course hiring more staff will mean higher labour costs for companies, but just think about the financial consequences of the stress that will take its toll on overworked employees sooner or later. Surely the expression “prevention rather than cure” makes sense here. 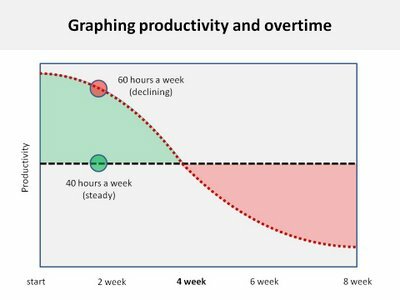 How productive we are when working 60 hours a week compared to 40 hours a week. You might be curious just how many new jobs could be created with all the overtime being worked. For instance, in Spain in 2012, they could have created 72,000 jobs with the total unpaid overtime that Spanish employees were working. In the US, a quarter of all employees are working one hour of overtime per week, which is enough to fill 50,000 jobs. Imagine how much higher this number would be if all the employees that are working more than just one hour of overtime per week were included in these statistics as well. President Obama has promised an executive order that will make around half of America’s salaried employees eligible for overtime pay. Some believe that the consequences of this reform will be disastrous, with many employers forced to cut jobs. Many others believe that it can only have positive effects. If corporate America doesn’t want to pay their workers “time and a half” for their overtime, it would need to hire hundreds of thousands of additional workers, consequently slashing the unemployment rate. Fortunately, more awareness about overtime issues is being raised around the globe, through initiatives such as “Go Home On Time Day” in the UK and Australia, helping people reclaim their work/life balance. Influential magazines are writing articles about the subject and offering their readers advice on how to improve their work/life balance, showing that they acknowledge the problem and want to help address it and create more awareness. Solutions are taking shape, even on a higher level . Germany is considering introducing a work-related stress law, a great initiative towards a better work-life balance for German workers. What can employers start doing right now to break the chain? First of all, it is important for companies to gain an understanding of volume and demand profiles, in order to plan working time more accurately. There are various types of workplace management software on the market that can help companies design shift patterns to reallocate resources which meet the highs and lows in demand, consequently leading to a reduction in the need for overtime. Demand-led rosters can be implemented in companies with a fluctuating demand for labour. Having flexible labour resources ensures that demand can always be met without the need for excessive overtime. Masterclasses in employee resourcing can help to optimise a company’s workforce in a way that benefits both employers and employees. Another important step is the realisation that hiring more staff is actually an indication of success, allowing a company to continue to operate at a productive pace without wearing out existing staff and decreasing productivity. We can all contribute to a positive change, by valuing our own time. If Facebook COO Sheryl Sandberg can leave the office at 17.30 every day to have dinner with her kids, then so can you. Managers can lead by example, by leaving on time, taking regular breaks and encouraging their staff to do the same. Reward employees for their productivity instead of their hours worked, and remind them that the best way to get more done is to spend more time doing less. If we have the desire to change our unbalanced work culture then we should be able to achieve it.